Sahara Sunrise Body Butters are made with carefully selected natural oils and butters that offers you well nourished, glowing skin. 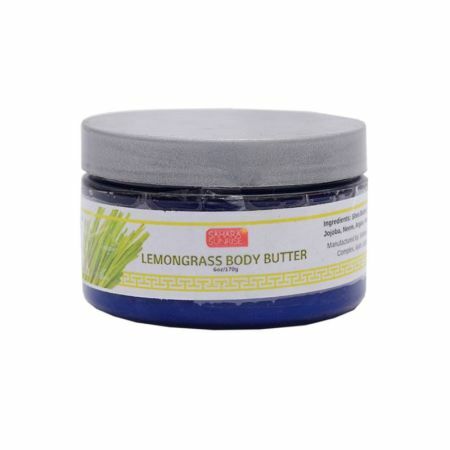 You will love the energizing & uplifting scent of lemongrass in this butter. In our Body Butters, we have added an ingredient that we’ve found to be simply amazing – Neem oil! This oil has gained popularity because of its ability to regenerate, strengthen and protect the skin against free radical damage. Once we came across this oil we knew we had to add it to our power-packed body butter. The best part is that it is a ‘Proudly Nigerian’ product! Use! Enjoy! Smile! Ingredients: Shea Butter, Cocoa Butter, Mango Butter, Coconut Oil, Jojoba Oil, Argan Oil, Neem Oil, Avocado Oil, Calendula Extract, Fragrance.